We're being treated to a steady flow of new updates now, with even more on the way. The most interesting so far has been this Game Maniacs broadcast with KobaP since it isn't shy about revealing a few previously-unseen interface elements. Thanks go to OneSanitarium for flagging it up this morning. Then there's the T.M.Revolution version of the second promotional video, which technically isn't new. Still, I'm not going to pass up an excuse to embed some T.M.Revolution on my blog. We heard a few days ago that there would be a pair of broadcasts on Nico Nico Live on 23rd and 30th August 2016 at 19:00 Japan time, hosted by Nico Nico personalities Edosan" and Fumiichi, and Furukawa Mirin of DEMPAGUMI.inc. The links for both broadcasts are now live so the timeshifts can be reserved if you have a Nico Nico account. I don't expect any new information to be revealed at this point other than a mission here and there, but it's always possible. The Twitter reveal of the sixth special weapon based on a regional food speciality came along as expected, showing off Masayuki's special weapon Zeppin Kougyo which is a fancy arrangement of ayu (sweetfish). I wonder how these food-themed weapons are obtained? 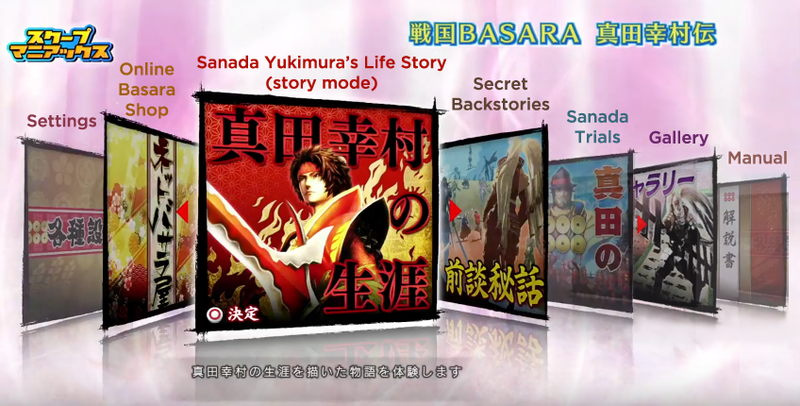 Other updates have included formal confirmation of free mode once you've cleared the game's main story stages and a bunch of screenshots from the opening sequence which have been released to the Japanese gaming press. There's also one last(?) major Twitter campaign which is offering merchandise for participating in social media activities. Speaking of the opening, it's a little unusual that we haven't heard anything about an ending theme at this point. Could it be an instrumental, or a remix of the opening song? In Japan and not sure about whether to buy Yukimura-den? Visit a game store! Games shops across Japan will also be running a series of in-store demo events next weekend. 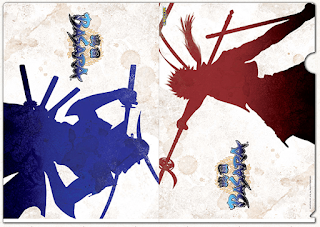 Those who try the game out will receive a special Sengoku Basara clear file as a memento. Here's a short message from actor Nakamura Kankuro VI to promote the tie-in with the upcoming Sanada Juuyuushi ('Sanada Ten Braves') movie. The collaboration also featured in the news today thanks to a joint press conference about the game and movie. The first volume of the manga is scheduled for release on 20th October 2016 under the Young Champion Comics label. The price is officially ¥562 before tax, and it should start appearing on other import sites very soon. 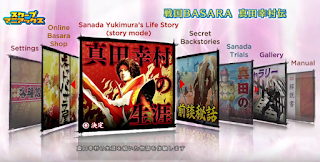 A special Sengoku Basara: Sanada Yukimura-den Release Date Memorial 'Sanada Pilgrimage Day Trip Tour' will take place on 15th October 2016, taking fans around the Ueda area and ending with a presentation by series producer Kobayashi Hiroyuki. Some special illustrations have been revealed showing Yukimura and Sasuke enjoying konetsuke mochi and hot springs; these pictures will appear on keychains, stickers, badges and other goodies available to those on the tour. Cute! 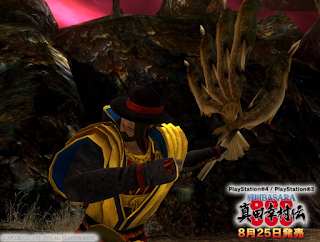 They never fail to amaze me at the Main Menu design it looks amazing , its way better than what Koei Does . Ah I was just clamoring for a tankobon of Dokugan! I'm glad to hear it's coming out so soon. Around the same time as the Honnoji stageplay no less. Looks like I'm going to be getting a few different SB things in time for Halloween.